Multifunctional Unisex Skull Bandana - 20 DIFFERENT DESIGNS! This skull mask can be used in many different ways for different activities! Can be worn in different kinds of weather. Made of high quality polyester. 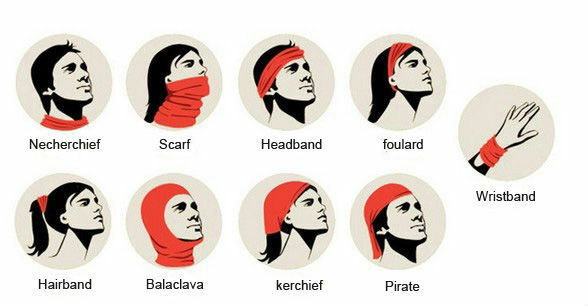 You can make a hat, a scrarf, or a face mask, a bandana, beanie, headband, wristband, helmet-liner, muffler, neck gaiter, dust screen or hair band. -SUITABLE for Cycling, Hiking, Camping, Skiing, Climbing, Fishing, Hunting, Jogging, Motorcycling, and so on.